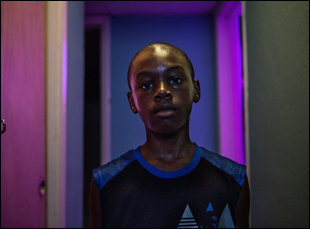 James Laxton and Barry Jenkins were walking down Miami Beach one night in preparation to shoot “Moonlight,” talking about how exactly they’d capture what naturally had to be the signature image of the film given its title. Timed to literally serve as the centerpiece of the story of Chiron, a young, gay, black man trying to find his way in the world and out of poverty where he resides with his drug-addled mother, the scene may most obviously convey the sensation of touch since it is the first time Chiron shares a kiss with someone, his closest friend Kevin, but suddenly looking up at the stars, you realize he can see clearly for the first time, the moon as crisp as its ever been and potentially lighting the way forward. Laxton is an exceptionally gifted cinematographer who has long specialized in such images, using the open air in such films as the Guantanamo Bay-set Kristen Stewart drama “Camp X-Ray” and the Sequoia Forest-set romance “Leave Me Like You Found Me” to suggest how the limitless potential of the sky above can be paralyzing and making it all the more gratifying when the characters below find their footing. 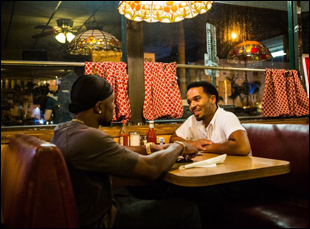 But to capture such emotion in the environment in “Moonlight” came with plenty of challenges as the ambient light that Jenkins had promised him that night in pre-production, spilling off of bars and clubs that lined the coastline didn’t reach the sea not moving the needle at all on his light meter. 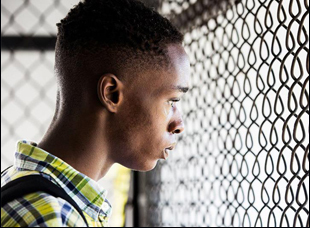 The result, as is the case with every stunning frame of “Moonlight,” is both original viscerally and familiar emotionally, allowing audiences to know Chiron deeply when he doesn’t even fully understand himself as you spend time with him in three separate segments – as a young boy nicknamed Little (Alex R. Hibbert), as a teen (Ashton Sanders), and eventually as the twenty something Black (Trevante Rhodes). Recently, Laxton spoke about reuniting professionally with his longtime college pal Jenkins (“Medicine for Melancholy”) to create one of the most indelible coming-of-age stories in recent memory, giving characters the room to breathe and creating a consistent look across three distinctly different chapters of a story. You and Barry went to school at Florida State together — how did you become collaborators? We met pretty early on within our film school history. I came in 2001 as a transfer student in and Barry had already been there a couple years before and we were very quickly became friends and collaborators and within that Florida State experience, we learned how to make movies together. That program was relatively small. You’re in there with 30 kids, so everybody gets to know each other really quickly. It’s a very immersive experience, so rather soon we became collaborators. We also became roommates for a while and watched all the same movies and started being inspired by all the same films, so it was pretty evident that even though we come from very different parts of the country, there’s a certain something that is clicking with how each of us sees the kind of images that we want to present to people. You’re always so great at evoking the place you’re shooting – how much groundwork did you do in Miami? It’s funny, I think the only time I’ve probably been to Miami before doing “Moonlight,” was as a 12-year-old just on vacation with my family, and I was on a beach, so it wasn’t anything like Liberty City or anywhere else we were shooting in the film. But location is super important for me and Barry as well — it’s where we make decisions from. I don’t think that he, in the writing process, nor I in the pre-production process ever attempt to apply our stamp on something that we are experiencing. We tend to make decisions upon what the cast and the locations are giving us. That’s generally what our creative process is like, so shooting in real places like [San Francisco for] “Medicine for Melancholy” or Miami with “Moonlight,” we were reacting to what these cities gave us, which is probably why “Medicine for Melancholy” looks so much different than “Moonlight” because that’s what the city was giving us. You can feel the city in just the appearance of the actors — Barry has said this was a “no powder, just oil” shoot in terms of makeup, so their skin would be reflected differently. Was that an adjustment for you? The way in which the performers’ skin looked on camera was critical to us. Miami, obviously, is associated with the humidity, the heat and the lushness of that place, so there was no powder at all involved because it was more important to make sure that the audience felt the way in which the perspiration is catching on the actors’ skin and reflecting in our lighting and how we’re capturing things in camera. That was actually integral and very, very purposeful. We actually made strides to make sure that was there even when it may not actually have been, and it also had so much to do with how we lit our actors as well. That reflective quality to skin was all about how we wanted to make sure our images were rendered. You’ve said you worked with a colorist before shooting, which seems a little unusual since that’s something you’d typically do in post-production. How did it help? Alex Bickel, who’s the colorist in “Moonlight,” and I have actually done a number of films — I think “Moonlight” is our seventh film together — and we have a great deal of trust within the two of us. [Alex] was kind enough to have us send some images that we shot in our preproduction stage just as tests basically and then apply what he thought would be a good color grade to them that would then inform us on set as to how we’d approach and expose and light our scenes. It was great to have that kind of collaboration and that relationship with a colorist – because it either can inform changes as to how you thought you would approach something or just reinforce that the choices you’re making are the right ones. It gives you that confidence going into a project knowing full well when we get to this stage of the process, it’s going to look somewhere along these lines. How did you figure out how you’d move the camera? In particular, that proximity to character where for instance when a car door opens, you swing around with it is fascinating. There was an agreed concept early on in preproduction that probably started before I even got involved, of the idea of presenting an experience for the audience that is not rooted in realism, but more so in an experiential process that has more of a first-person perspective. That idea of really seeing [what happens] through Chiron’s eyes lent itself to these decisions about let’s bring the camera very close to Chiron and inside conversations [where] at times, we’ll even have actors look into the lens and deliver dialogue. We didn’t want to just present a narrative. We wanted to present an experience. So all those ideas of how the camera moves, where it’s placed within a scene — I’m reminded of the scene where Juan, the character played by Mahershala Ali, brings the young Chiron into his house after they go have their little meal at the diner shop and there’s the shot where the camera pans across all three of them and it’s almost as if you’re at the table with them — I think that’s what we’re going for with this idea of immersion. You throw down the gauntlet with that opening tracking shot around Liberty City – did it emerge from that idea? Yeah, I think so. Opening sequences for any movie are critical because it obviously establishes the language of how the audience is going to experience this narrative, so steadicamming through that conversation back to the car is about creating that experiential perspective that allows the audience ideally to feel comfortable engaging with the location and engaging with the characters in a first-person perspective and subjective angle on things with the intention ultimately of having as large of an emotional impact as we possibly could. Were there any foundational ideas about composition? You shot in anamorphic, which gives plenty of space around the subject. Obviously, we thought a lot about it and, just generally, isolation was something we paid close attention to in how we framed things. [Chiron’s] on a journey to find himself and he’s in search for an identity, so while anyone is on that journey, you can sometimes feel a little lonely in those moments. That’s applicable to everyone, whether you come from Liberty City or anywhere in the country or the world, so we composed our shots accordingly. When we’re photographing Chiron in the foreground and maybe his classmates or his friends are playing ball behind him, so they’re deep in the background with a sense of the small depth of field, that has to do with how much he feels alone during this journey where he’s on. To make this character consistent throughout, were there certain images you may have referenced in one segment to inform another? We were more concerned with telling a feature film than three stories in terms of how we approached things visually, so we were lighting them in a very similar fashion, even though these characters change physically. At the end of the movie, [Black] is very strong, built and tall and at the beginning, he’s obviously a lot shorter and skinnier and our intention was to visually represent them in the same way to create that continuity in terms of how we are in the eyeline to the actor or where does the light fall on his face and shape the light. Was there a particularly challenging day of shooting on this? There were a lot of challenging days, but in a good way. The swimming scene in story one was hard physically to battle the tide. There was also a massive storm that happened that day, so everything that was shot in that sequence was shot in an hour-and-a-half, as opposed to what was scheduled to be six hours, so that was challenging. What’s it been like to see this all come together? It’s obviously great when your work resonates with people. As artists, that’s what we’re hoping to have happen and it seems that “Moonlight” has done that. People are responding to it in a positive way, which is very heartwarming and very humbling. It’s a wonderful moment that we’re all sharing right now. But I think if anything, what I take away from it is this idea that we should go back to work. [laughs] We should do it again. 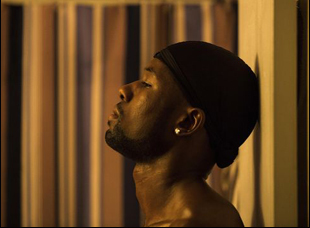 Interview: Editors Joi McMillon & Nat Sanders on Shaping "Moonlight"